It has been credited as key to Switzerland’s transformation into one of the world’s wealthiest and most sophisticated economies from a largely agrarian society. The country’s impressive dual-education system provides young people and mid-career workers alike with high levels of theoretical and practical vocational training and ensures its citizens have the skills required to run its innovative industries. It will now be available to the workers in the United States. Swiss pioneering technology leader ABB on Monday joined a US government job training initiative, known as the Pledge to America’s Workers. Along with a group of other Swiss-based companies, including Zurich Insurance and train builder Stadler, ABB agreed to embrace apprenticeship programs as part of its broad effort to support training for skilled manufacturing jobs in the United States, where the company has 24,000 employees. Apprenticeships, common in Switzerland and other advanced European countries, have not played a major role in job-training programs in recent decades in the US, where there have been few formal government programs to encourage them. Instead, companies like ABB have relied on broader cooperative efforts with local schools and colleges in what Scheu has referred to as a “pre-K to post-doc” approach. The idea is to engage students even before kindergarten to encourage an interest and commitment to careers in high-skill manufacturing. The outreach efforts continue all the way through advanced, post-graduate education. The Trump Administration is now urging the Swiss government and Swiss companies with workers in the United States to share their expertise in using apprenticeships as part of a broad approach to skills training. ‘‘We value learning from other countries,” said Betsy DeVos, the United States Secretary of Education. She said she visited Switzerland in June and saw first-hand the value of work-based learning, and was inspired by the fact that more than two-thirds of Swiss high-school students pursue their learning through apprenticeship programs. The pledge stems from an executive order by President Donald Trump last year calling for measures ‘‘to provide more affordable pathways to secure high paying jobs by promoting apprenticeships and effective workforce development programs. ‘‘The Business Roundtable, a corporate association of which Greg Sheu is a member, had previously expressed support for Trump’s order. Edward McMullen, the United States Ambassador to Switzerland, praised the Swiss-company executives for signing the agreement. "Your pledges underscore your commitments to the American economy and enhancing our mutual prosperity,” McMullen said. Like many modern global manufacturing companies with American operations, ABB – which has more than five dozen manufacturing, assembly and service sites in the United States – often has more good jobs available than people with the skills to fill them. That is partly a result of the company’s rapid growth in the US, where seven years ago ABB employed only about 4,000 people – one-sixth the number of today. More than half of ABB’s US workforce is employed on factory floors. “The Automation Readiness Index,” a global study this year by The Economist Intelligence Unit with ABB’s support, found that the US ranked only 9th among industrialized nations in preparing the workers of tomorrow for careers in an economy where robotics-driven automation and artificial intelligence will augment human work. (South Korea led that list, followed by Germany and Singapore.) The biggest factor, the study found, was whether a country has an education and training system in place to prepare workers for the skilled industry jobs of today and tomorrow. ABB has found that in the US, training and retaining workers must be a highly local effort. That is why the company is already actively involved with community technical colleges in training programs. With Wake Technical Community College in North Carolina, for example, ABB has not only provided control systems and robotics, but has also worked to train instructors on how to teach their students on the equipment. 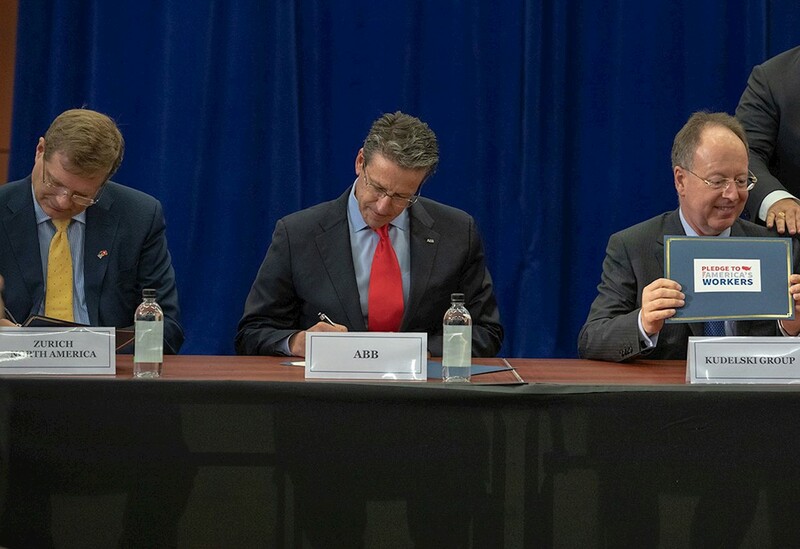 But even as it helps train and recruit new workers, Scheu stressed that ABB’s commitment also remains strong to its current US employees. ABB will continue to reimburse eligible employees for educational courses that enable them to perform their current jobs more effectively or prepare them for future positions within the company. And recognizing that high-tech manufacturing will require continuous reskilling over a person’s career, ABB plans to continue offering employees training and education to help them adapt to new technologies and changing environments.